2017 Liquid Force Foil Short Mast 60CM. 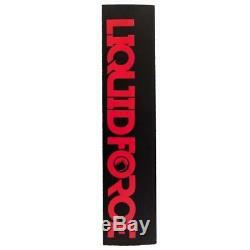 This short mast from Liquid Force is 60cm in length and a great way to either get into the craft of foilboarding or to foil in shallow waters. The mast is the same profile as the Happy and Rocket masts and is compatible with the Happy and Rocket Foil boards. FORCE Kite and Wake is one of the largest retailers of kiteboarding equipment in the country. We stock hundreds of kites, kiteboards, harnesses, and accessories. All of our employees are experienced kiteboarders. The item "2017 Liquid Force Foil Short Mast 60CM" is in sale since Saturday, September 16, 2017. This item is in the category "Sporting Goods\Water Sports\Wakeboarding & Waterskiing\Wakeboards". The seller is "forcekiteandwake" and is located in Mount Pleasant, South Carolina. This item can be shipped worldwide.